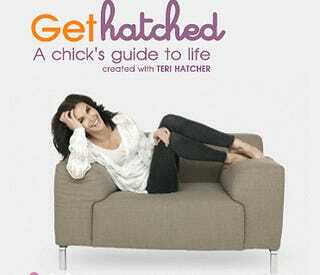 Teri Hatcher's new website, Get Hatched (a chick's guide to life) is up and running. In a video clip, she claims the site "is not the Teri Hatcher reality show." No — it's more like a self-help book on uppers. The Desperate Housewives star, a forty-five-year-old single mom, explains: "We are offering an entertaining, feel-good online community for women that will touch on various common issues and struggles that matter to women from all walks of life." Translation: This site is full of happy thoughts and giggles and phrases like "your true self" and "new you!" She also says the site is "about finding your way to the ME part without getting lost along the way. My desire is to be able to reach women, lots of women, and supply just the right boost they might need on any given day." It's about embracing that as a woman, I'm not just defined by my form, if my breasts sag or if there is any cellulite on the back on my legs, if my knees and elbows have droopy skin or how many wrinkles I can find on my face… I work in an industry that seems to care a lot about all of this, and frankly makes lots of money off making everyone in the country care, too. It's like GOOP, but the cleanses revolve around Teri Juice. But while GetHatched is a happy place to be, where everyone is smiling and embracing themselves and dishing out solutions to life's problems, it also feels like, well, of course these women are gushy and enlightened and "empowered chicks" — they're white and rich. Sorry. Guess I'm too negative to get hatched. Bad egg, out.